Iowa Sen. Joni Ernst, a Republican, says the Senate was "damaged" by the partisan and at times vitriolic process to confirm Supreme Court Justice Brett Kavanaugh. Ernst spoke with CBS News' Major Garrett for "The Takeout" podcast on Thursday at Uno Pizzeria and Grill in Union Station, discussing politics over a Chicago-style pizza pie. When Garrett asked if the Senate was "damaged" by the process, Ernst immediately said "yes." The Senate confirmed Kavanaugh on Saturday by a 50-48 vote that fell almost entirely along party lines. The process had been stalled by allegations of sexual misconduct against Kavanaugh by at least three women. Kavanaugh and the first of these accusers, Dr. Christine Blasey Ford, appeared before the Senate Judiciary Committee at the end of September. The FBI conducted an investigation into the allegations the week before Kavanaugh was confirmed. Ernst, who voted to confirm Kavanaugh, said that she believed that "Dr. Ford did experience some sort of trauma in her lifetime," but that she did not believe "Brett Kavanaugh perpetrated the intimate crime against her." She condemned Democrats for politicizing Ford's allegations against Kavanaugh, saying that the Democratic motivation behind calling for a hearing was "to sink Kavanaugh." "They threw her to the wolves," Ernst said about Ford, who had initially wanted her allegations against Kavanaugh to be kept anonymous. 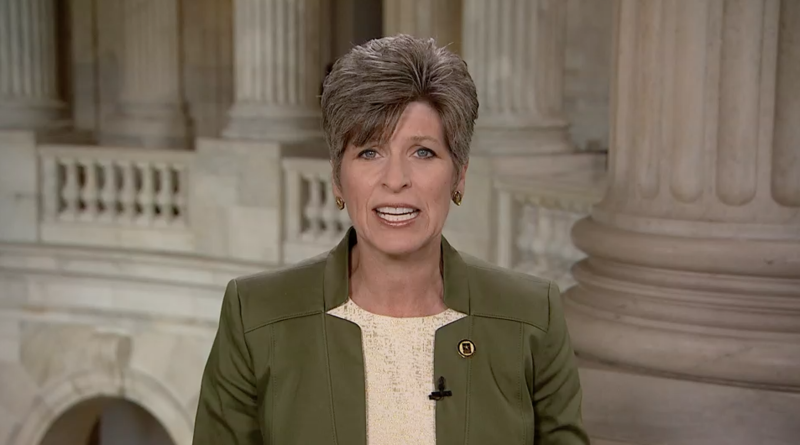 Ernst volunteered at a women's crisis center and on a crisis hotline while she was at Iowa State University, and worked with women who had been abused, so she said that sexual assault was "a very important topic to me." "This is my statement to anyone that is a survivor of sexual abuse, is that if you are comfortable coming forward right away, you need to do it right away," she said, discussing the importance for survivors to be heard. "You certainly don't want to wrongly convict someone who is innocent, but you also want to make sure that accuser is heard and has the opportunity to step forward." Ernst also discussed President Trump's relationship to North Korean Leader Kim Jong Un on "The Takeout." Mr. Trump said at a rally in September that Kim had written him "beautiful letters," and that the two leaders "fell in love." Ernst disagreed with the president's praise of Kim. "I hope the president was being sarcastic," she said. "I think Kim Jong Un is a horrible man, because he is an extreme dictator, he kills his own people, he has no care for his own people, he keeps that country closed off in a tight hold and he threatens the rest of our region as well as our nation." Ernst also said that she had "reservations" about Kim's promises to denuclearize North Korea. On the home front, Ernst also discussed the president's $12 billion aid package sent to farmers feeling the effects of a trade war with China. "What our Iowa farmers have been insistent about is trade, not aid," Ernst said. "They're very proud. They want to see their goods go to market." For more of Major's conversation with Joni Ernst, download "The Takeout" podcast on Apple Podcasts, Google Play, Stitcher, or Spotify. New episodes are available every Friday morning. Also, you can watch "The Takeout" on CBSN Friday at 5pm, 9pm, and 12am ETand Saturday at 1pm, 9pm, and 12am ET. For a full archive of "The Takeout" episodes, visit www.takeoutpodcast.com. And you can listen to "The Takeout" on select CBS News Radio affiliates (check your local listings).